Many will reckon that the dining table is the most important furniture in houses, especially during the holiday season. Whether it is a traditional dining table that is used in the middle of a traditional dining room or a front and center dining room in an open kitchen, the dining table is a place to gather and enjoy each other’s company. As such, it needs to bring forth more than captivating aesthetics. It needs to rock sturdy, comfortable, accommodating, and in some instance, flexible in sizes and shape. With this in mind, herein we will explore the essentials of a dining table that you have to be cognizant of when shopping for one. The material used to manufacture the table determines the longevity of the dining tables. As such, when you purchase a wood dining table, ensure that it is made of hardwood material such as oak, maple, mahogany, teak, and walnut instead of composite wood such as hardwood solids, plywood, and Medium Density Fiberboard (MDF). This is because while engineered woods such as MDF that is made by compressing and compacting softwood and hardwood bits into board form, thereby making them quite durable and strong, the material is not as hardy and strong as hardwood is. By extension, while MDF will exhibit sturdiness in the short time, hardwood material will retain its strength and sturdiness for longer, therefore, outlasting the engineered material. The exception to this recommendation is when you move the table quite a lot and, therefore, need a table with removable legs. Tables with removable legs are usually made of fiberboards, a material that is made by pressing scrap wood material. While the material is not a good long-term option, it is the best option when you have to move the table quite a lot. On the other hand, if you want material other than the traditional hardwood, there are plenty of option on the market today, including molded plastic, galvanized metal, and grainy marble. You might be tempted to go a thick wood veneer. Do not! Thick veneers tend to lift from the main piece over time rendering the table useless. To know whether a veneer is thick you simply have to look for obvious seams between the main piece and veneer at the corners. It will also feel plastic to the touch. If you want to save some money on a table then avoid veneer and go for a reclaimed wood table instead. You do not want to install a dining table in a dining room, only for the table to make the room feel cramped rather than cozy. With this in mind, you should always measure your room and determine the best dining table size. This is especially important for smaller dining rooms, where you can install the traditional rectangular dining table only for it to fill up the room. While taking room measurement, you should aim to have sufficient space for you to walk around the table when the chairs are not in use and, therefore, drawn out. A 50” all round space between the wall and the edge of the table should be the minimum space to leave behind. While your dining table style will somewhat determine the shape of your dining table, there still are golden rules when it comes to choosing the dining table. Not every shape of dining table will suit your dining room. With this in mind, if you have a small room, go for an oval table, a shape that makes the dining room look roomier. If you have a narrow room, opt for a square table. If you have a long dining room, a rectangular shaped dining table is a perfect choice. 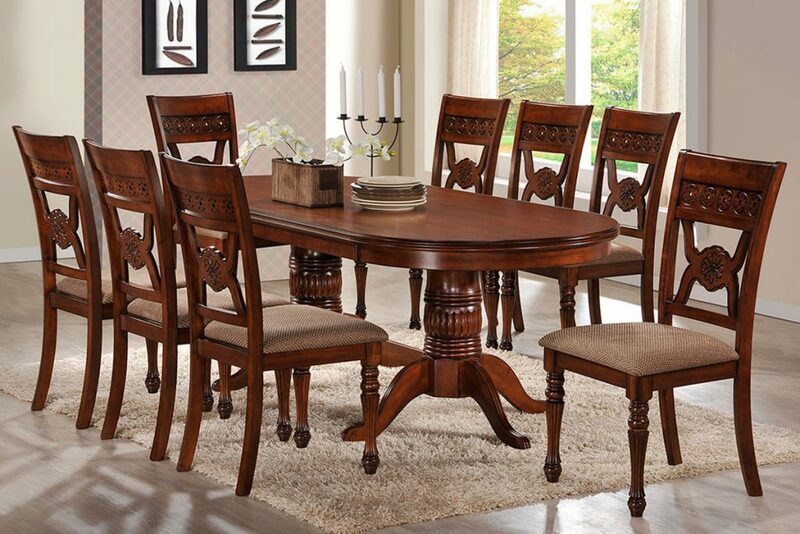 If you have ample room and you need your dining table to accommodate more people, a round table is a perfect choice. Dining table height usually ranges from 28 inches to 30 inches tall. For the most comfortable dining experience, the table should leave ample room above one’s knees but also be of the same level as your elbows to when you are sitting at the table. With regards to the width of the table, it is generally standardized at 36 inches wide. The length of the table is determined by the number of people you are looking to accommodate and the size of your dining room. To give you an idea of dining table dimensions in relation to the number of people accommodated, consider this; an oval table that is 84” long table will accommodate a maximum of 10 people. However, if you need a table that can accommodate a large group of people but you do not have ample room, you can opt for a table with leaves which expand and fold as needed. When you are on the market for an outdoor patio or terrace dining table, you need to consider the material the table is made of, naturally going for weather-resistant materials. The most popular weather resistant material is natural teak as it is impervious to water, does not warp, and resistant to rust. Other options include powder-coated steel.